It can take a long time to make a tent fly — but it’s worth it. A few years ago I didn’t know what I tent fly was, at least not by name, but on one of my visits to Eastfield Village I saw a nice one that Billy McMillen built and used. 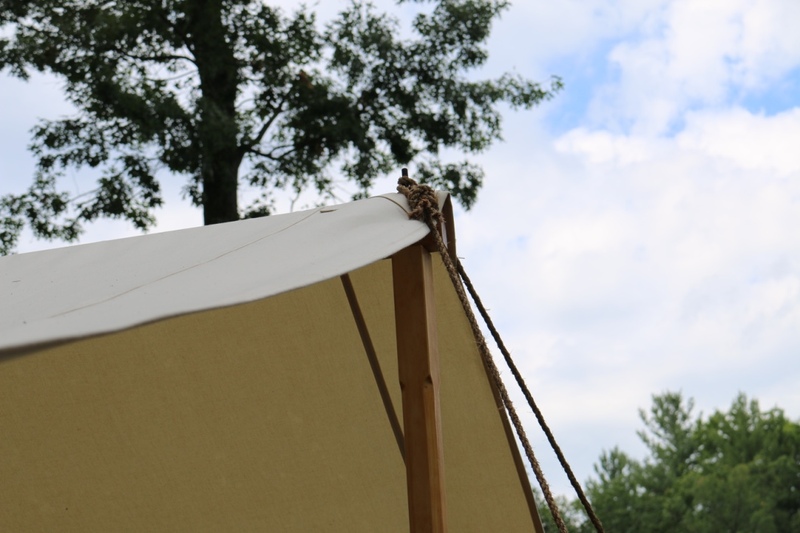 On some visits to Colonial Williamsburg I also checked out a huge tent fly that Garland and Ted and the guys had and decided I wanted to build one for myself. 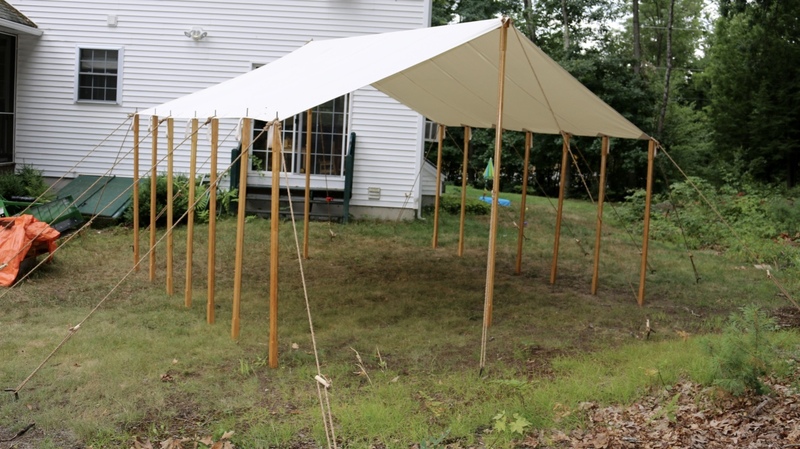 I wanted a place to work on timber framing elements out of the sun and rain, a tarpaulin for when we have a party in the yard, maybe a craft fair or a re-enacting event. Tent Fly ready for use. 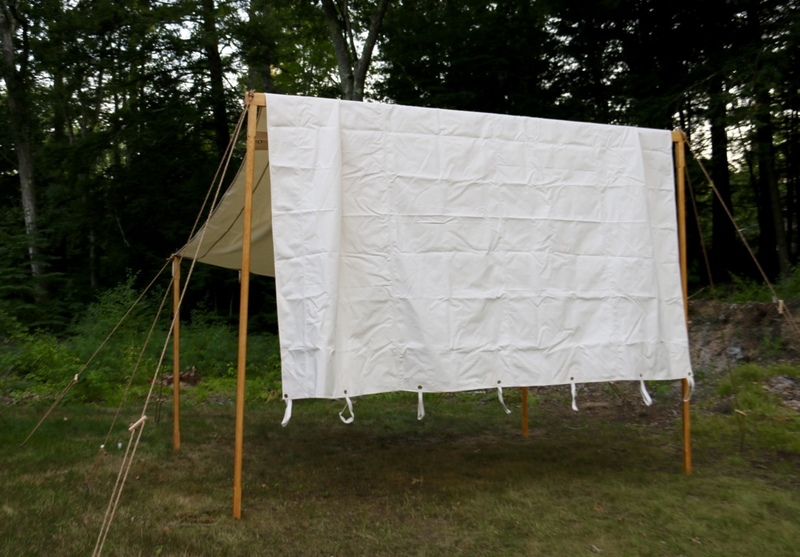 I decided to go with a custom made tent fly from Panther Primitives — an outfit Billy and Garland both recommended and big in the re-enacting community for making top quality tents. I went with the 12’x16′ Tent Fly with the 13oz Flame Retardant Sunforger Heavy Duty Canvas. 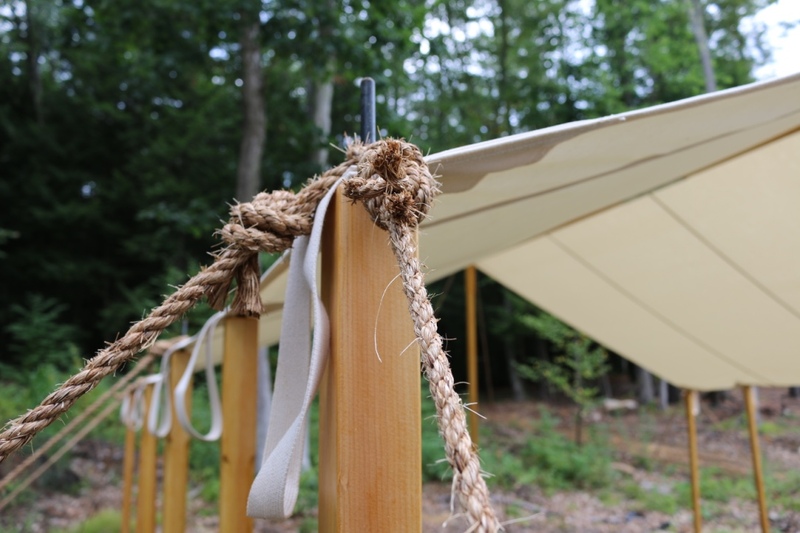 I also had a special request to have grommets and loops so I could support the outer edges of the tent with a series of posts or a post and beams depending on how the fly will be used. I also ordered 16 manila rope sets, heavy duty stakes, a canvas bag for the ropes, bag for the tent and bag for the ropes. The folks at Panther were great to work with and make and excellent product — superior materials and craftsmanship. 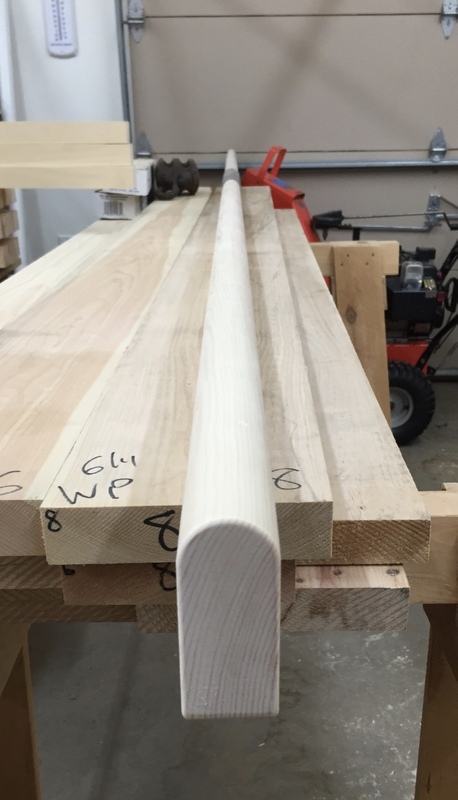 The project starts at the wood supplier — in this case Highland Hardwoods — my favorite. With the canvas taken care of it was time for me to build the necessary posts to support this tent. 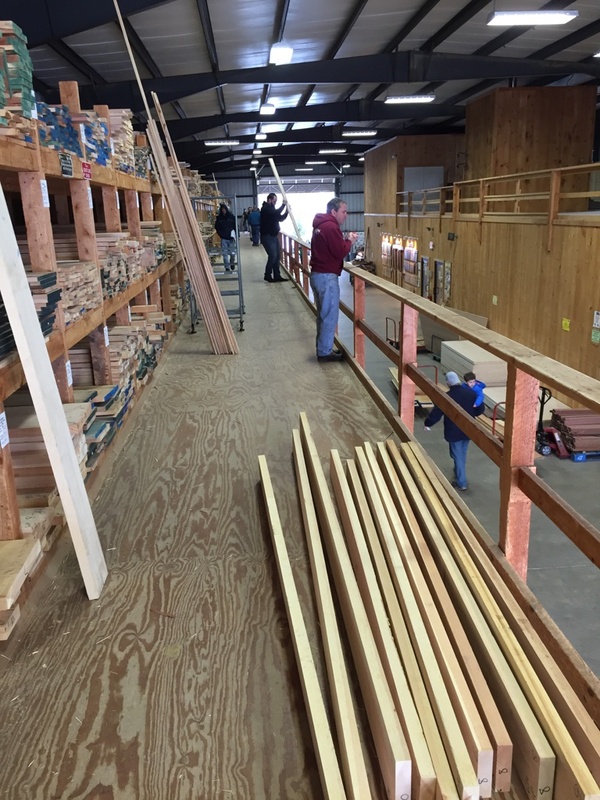 Like any good woodworking project it starts at your wood supplier. I went to my perennial favorite — Highland Hardwoods in Brentwood NH. 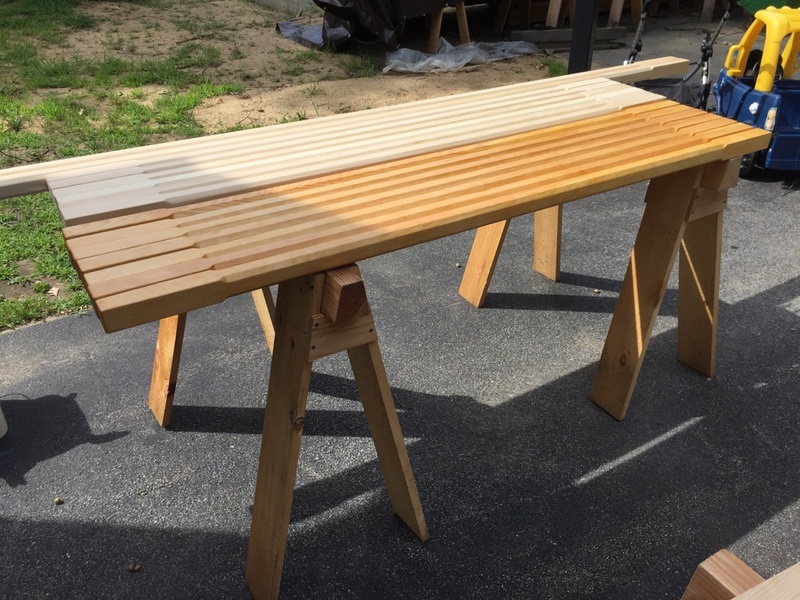 I carefully selected some straight grained 8/4 Eastern White Pine. I ripped the pieces to rough size, power planed and jointed each of the pieces and removed the mill marks with a hand plane. Carefully select straight grained easter white pine. 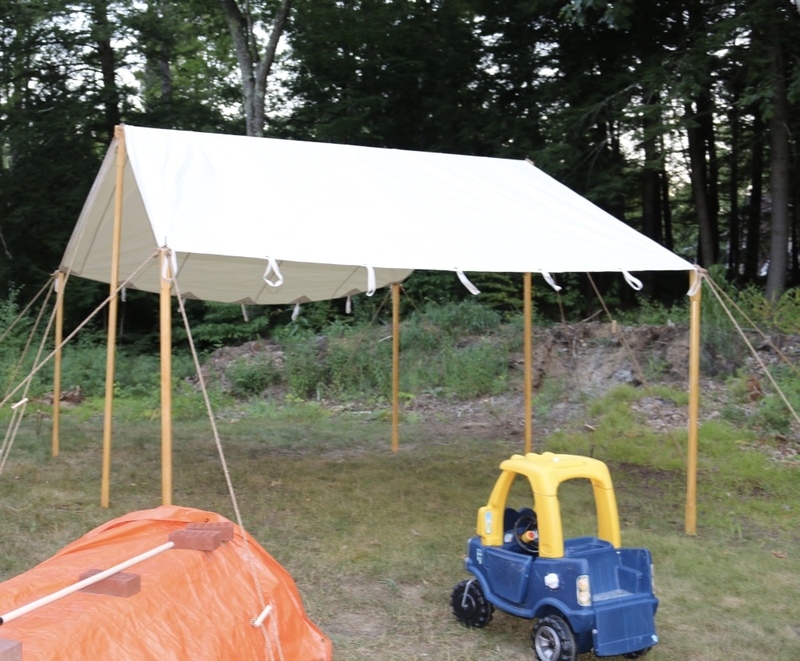 The center of the tent is supported by a larger beam –12.5′ long and roughly 2″x4″ — with a rounded over top. This beam is made from two pieces joined in the center with a simple metal connecting collar. Stock getting ripped down to size and hand planed. Rounding over top of beam. 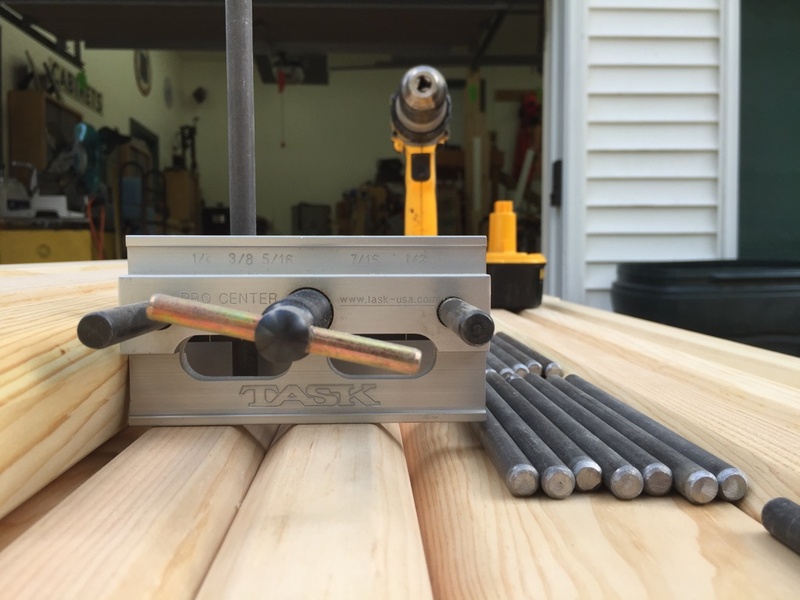 For each of the 2″x2″ upright support posts I routed in stop chamfers and used a 1/8″ radius rounding bit to break and square edges. Creating stop chamfers on all the posts. I then removed any mill marks from the routing. With 14 6′ tall posts and two 9′ tall posts it took a while to get all the woodworking up to this stage. 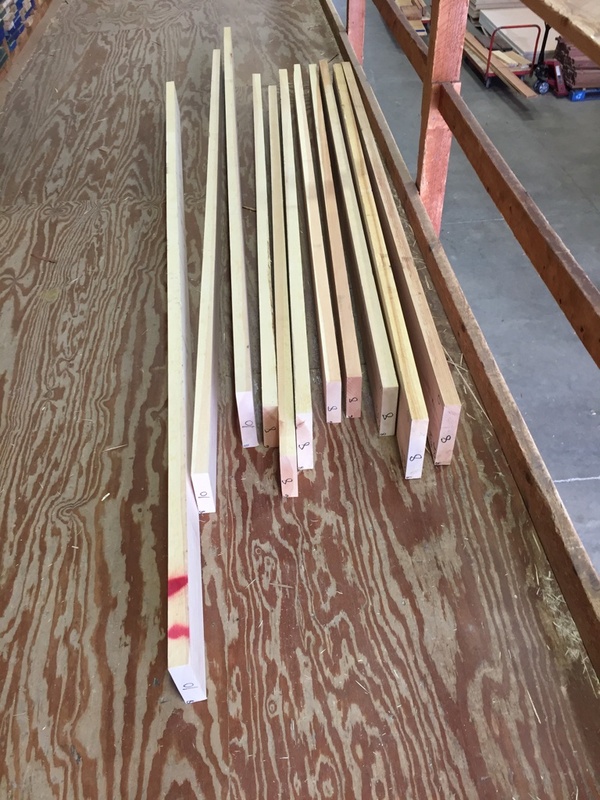 Next up was cutting 3/8″ metal rods to about 6″ long for each of the 6′ posts. The two 9′ tall posts needed 9″ long metal rods. Rods cut with metal cut off saw and edges ground back on a slow speed grinder. Once cut with an abrasive cut off wheel I rounded over the ends/corners of the rods on a slow speed grinder. 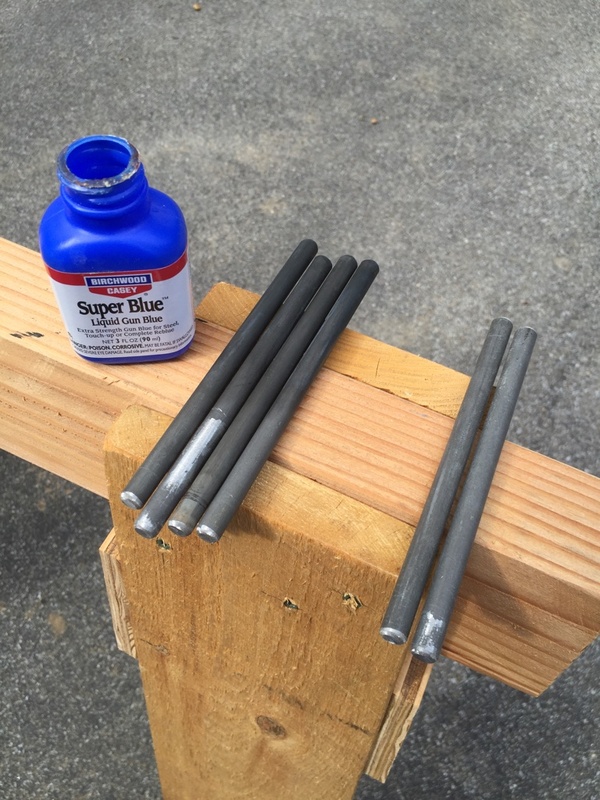 The mild steel rods from the hardware store are prone to rusting and have a bit of a modern look to my eye, so I cleaned them off with alcohol and then applied Super Blue (Gun Blue) to ends of the rod that would be exposed. The dark gray/black patina looked like older ironwork to my eye and at the least darkened all the freshly exposed steel from the cutting and grinding process. I’d also advise sealing it after that fact — with some lacquer or similar clear film finish that won’t react with he metal. I used a center finder gauge to mark where I should be drilling a 3/8″ diameter hole, 3 inches deep into the end of the posts. I also used a doweling jig keep the drill bit straight as I drilled into the ends of the posts. 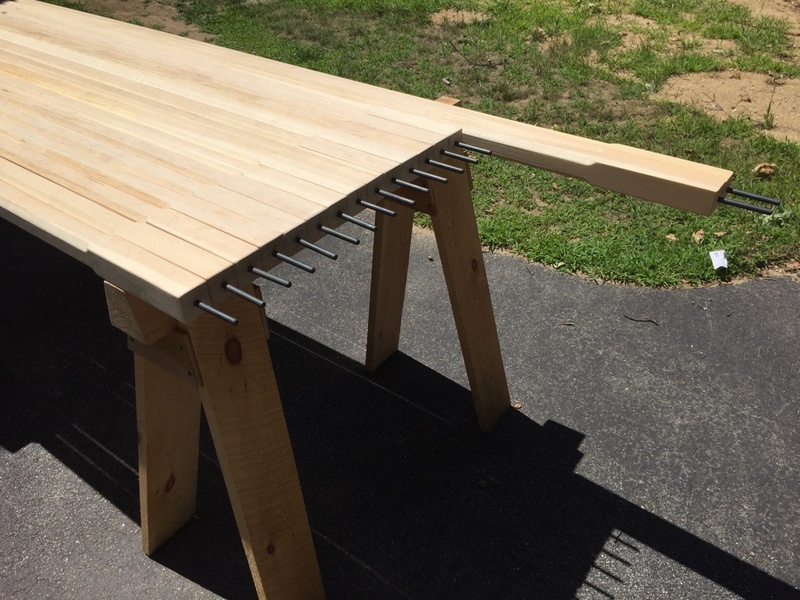 Doweling jig used to center and guide holes drilled into the end of the posts. 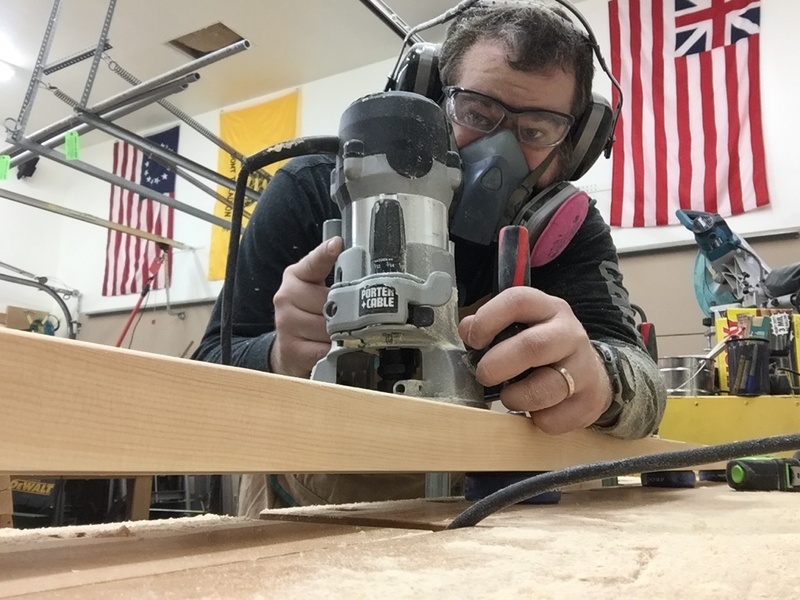 In order to accurately and repeatably drill to that depth and use the doweling jig which is pretty thick I needed to use two drills with the same size of bit. The drill (upper tool in photo below) is used with the jig to drill as deep as it will go. The drill is removed along with the jig. The impactor (lower tool in photo below) has a bit with an appropriately set stop collar to control the depth is used to complete the hole. The initial hole created using the drill and doweling jig provide a nice guide for the impactor + stop collared bit to reach the required depth. (Upper) Drill used to drill most of the whole through the doweling jig. (Lower) Impactor (or second drill) with bit and stop collar used to complete the hole at the proper depth. I then test fit/cleaned out the holes and glue the rods into place. (Make sure the blackened end is exposed). Ideally you want to use a high quality epoxy like the West System 2 part epoxy. I also installed tapered rubber washers from Panther that will help keep water out and keep the grommets where you want them on the metal rods. 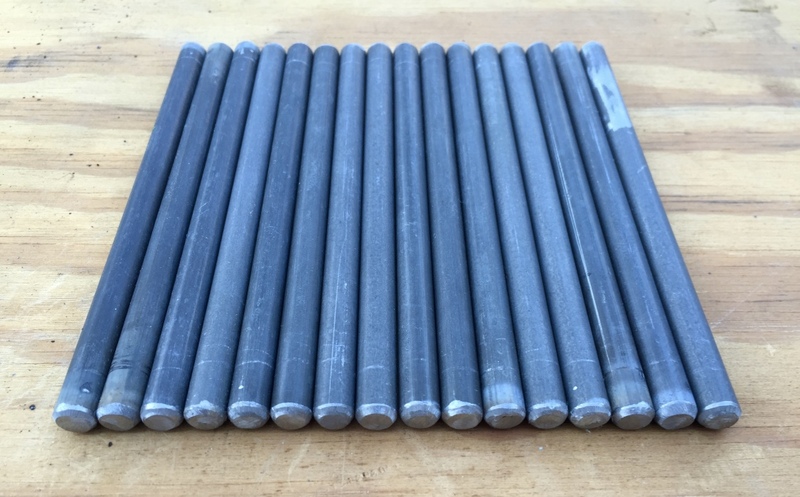 Rods glued and inserted into the ends of the poles. 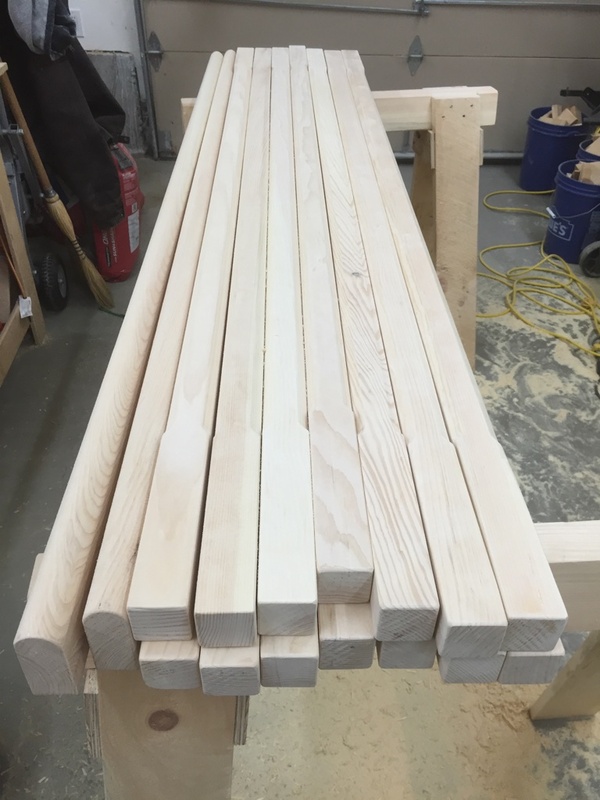 The freshly milled eastern white pine pine is a very pale white. Applied amber shellac to give the pint some color. Followed this up with some UV stabilized satin water based polyurethane. To give the wood a more pleasing color I gave it a coat or two of amber shellac. I then followed that up with two coats of a UV stabilized General Finishes satin polyurethane, sanding between coats as need. Fitting the metal connector to support the top beams. With the woodworking complete it was time to join the top beam together using the metal bracket. 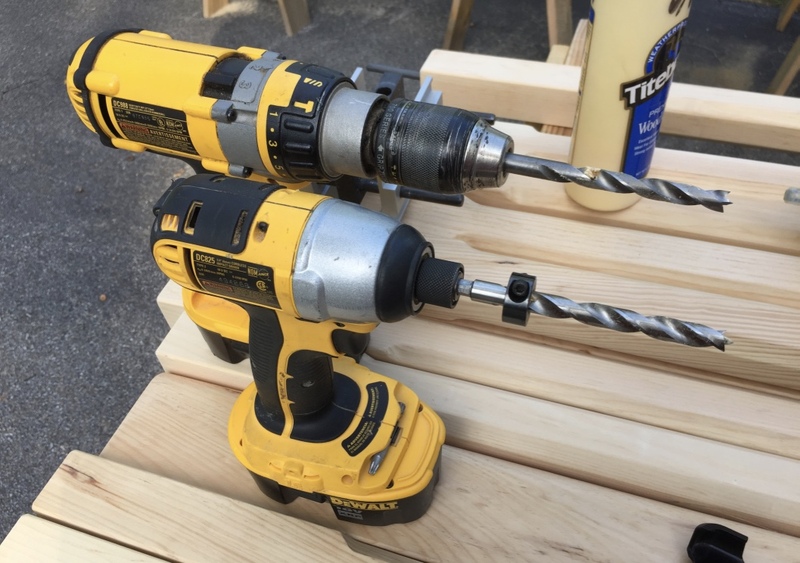 Use two large pan head screws to secure the wood into the connector. 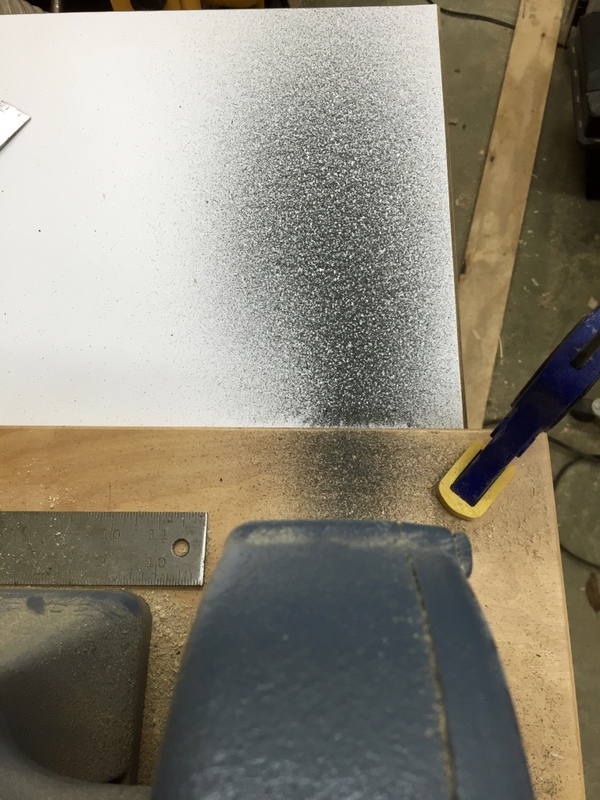 Also drill two holes through the top beam for the pins to pass through. 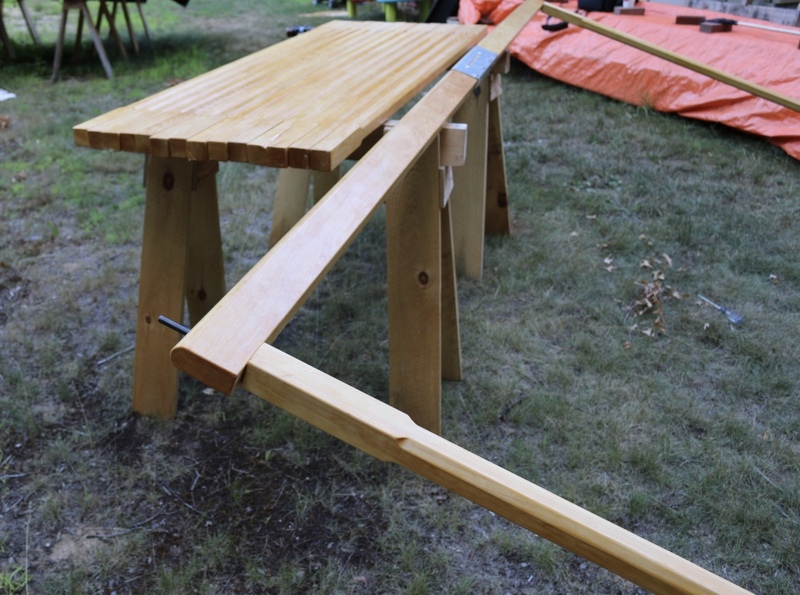 Insert the 9′ poles into the center beam. 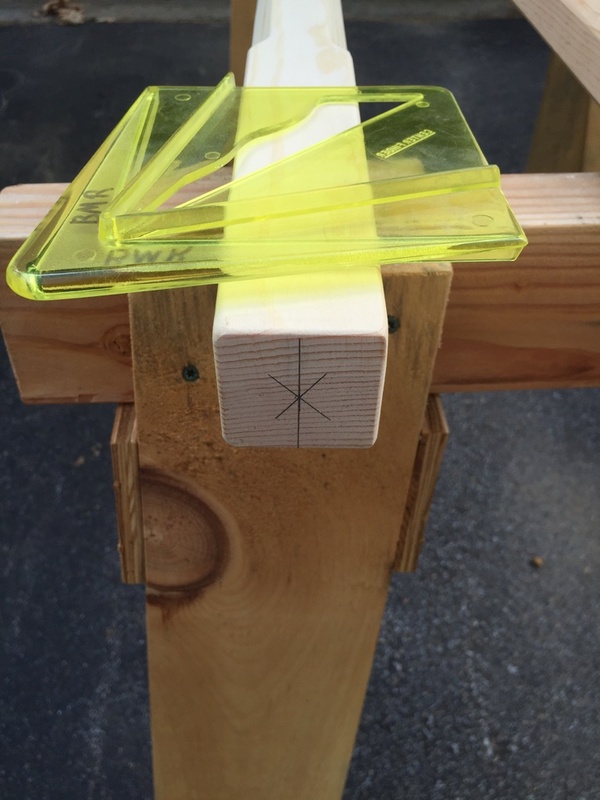 Insert the two 9′ posts into the vertical holes in the top beam. When I did the metal working I initially put the same 6′ metal rods into the 9′ tall posts, but realized the rod would not stick out the top of the beam, so I had to add 9″ rods to the other ends of the 9′ posts, but this worked out great as the accidental shorter rods now on the bottom of the tall posts help keeps the posts from kicking out when you are trying to stand up and secure the posts. Drape the canvas evenly across the beam. Drape the canvas over the top of the beam and carefully raise it to an upright position — you’ll want a helper for this. 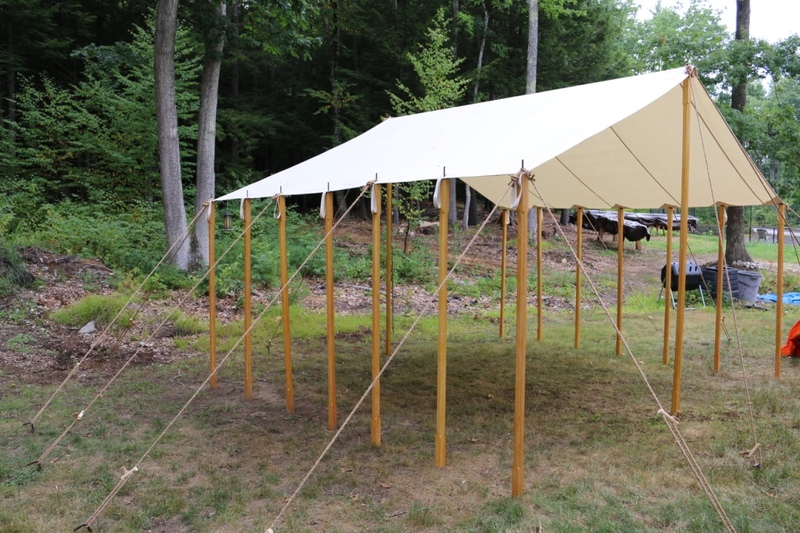 With the posts, beam and canvas in an upright position you’ll want your helper to keep it standing up while you secure the storm ropes — attaching them first to a stake you have to drive into the ground (with the stake angled away from the tent) with a heavy mallet, then to the rod on top of the post. Then use the wood block on the rope set to tighten up the rope. Raise the center beam, secure the support ropes and set the exterior posts and ropes. Next install the corner posts and install 2 rope sets on each corner deployed at 90 degrees from each other. Then install any additional posts you want to use. I built enough posts to fill every grommet on the canvas. Every other post on the side of the tent also got a single rope set and stake to further anchor the test to the ground. If you find your self coming and going through the lower side of the ten you can remove 1 or more of those side posts to give you better access. With a new canvas and rope sets you’ll want to check the ropes every day as things will stretch a bit and can get loose. Eventually they’ll stabilize and you can enjoy the use of your new tent fly. Storm lines at the ridge. The 9′ high ridge beam and 6′ high ends are a bit higher than average but allowed me to walk in and out of the tent with ease and gave me a good size work space under the protection of the tent. It was a lot of work and a lot of fun to put together and I look forward to a long useful life for this tent. P.S. If you build your own tent fly, please tell us about it in the comments below. Thank you for your very detailed directions in the construction of this tent fly. This certainly would a great addition for anyone who does fairs and re-enactments.